Last sleepy Tuesday (did I tell you that I don’t sleep on Mondays? 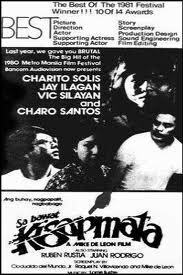 ), we watched Kisapmata, a 1981 film by Mike De Leon starring Charo Santos (now Charo Santos-Concio of Maalaala Mo Kaya), Jay Ilagan (who looks like the Roco twins), Vic Silayan and Charito Solis. The screenplay is by Nick Joaquin who, according to our professor quit writing novel after finishing two novels and who, also according to our professor is a great writer (yes, I give the credits to my prof). One of his work is Reportage on Crime. In the book is one of the crime story called “The House on Zapote Street” where the plot of the story was based according to a Wikipilipinas article. According to Sir Patrick (my prof in Film 100 by the way), Nick Joaquin predated magical realism, a genre in writing which one of my favorite author– Gabriel Garcia-Marquez, uses in his novels especially in 100 Years of Solitude (and in his other books as well). Also, according to Sir Patrick, Joaquin predated new journalism than the US. I’m amazed that such a Filipino writer exists before. But according to our professor’s description of Nick Joaquin, he is arrogant and a bragger (like this blog site, bragger. Just kidding). Anyhow, I’m just amazed by the fact that a Filipino discovered or used magical realism earlier than Gabriel Garcia-Marquez and the new journalism of the US (Nick Joaquin is a journalist by profession I think). It’s funny how we came up with these genres of the film. Obviously, romance because the story revolved around the struggle a.k.a. the Romeo + Juliet formula/attempt of the protagonists of the story– Mila (Charo Santos) and Noel (Jay Ilagan). We defined suspense in class as when you know something in the story that the characters, protagonists, soon-to-be-victims don’t know. Get it? So, the film is also categorized as a Romance-suspense. Next, suspense-thriller. I don’t really know (or I forgot) what the elements of a thriller film is. I think I have notes of it in the notebook that I lose. Too bad I can’t review it. I’m not making any excuses. But I already defined what a suspense is. I think we came to describe it as suspense-thriller mainly because the father in the film (Vic Silayan) makes us, the audience, feel scared when the father gets in the way between the couple, discouraging them to live separately from them. Horror is defined as having elements like light to very dark lighting, setting usually happens at night, and night or evening shot is mainly used. Also, sound effects like ticking of the clock, creaking of doors, barking of dogs, etc. are elements of horror films which are obvious (actually not very obvious if you’re not a keen observer of the film) in the film. The setting of the film has many recurring scenes at night. It is a family horror and a gothic horror at the same time. What differentiates a gothic horror from a family horror is the presence of incestuous desire (presented when the father seemed to have a desire for Mila but it was not clear, it was only suggestive for me. Still.). I should’ve been more educated about the characteristics of a horror film had I attended Sir Patrick’s faculty colloquium but I had Span 11 that time. It is also a family melodrama. According to our discussion, melodrama came from the words melos, meaning music, and drama which pertains to acting. I’m going to define what a family melodrama is based on what I understood while watching the film. Obviously there’s a presence of a family and their struggle about a certain family issue (i.e. Mila has to live separately from them since she has a married life now but the father– Tatang won’t allow because she’s the unica hija), thus the drama and the presence of sad music in the film. Crime genre lastly, is also found in the film in the last part where Tatang committed the crime. He shot the family and shot himself in the end too. Basically this is our discussion in class and this is what I can recall (with the help of my notes). Not that I’m bragging about this or whatever. I wanted to share that for the second time, I was disturbed while watching a film. The first time was when we watched Elephant by Gus Van Sant. I wanted to write about it also but was not able to do so. Maybe I did not have blog yet that time or was really busy. Anyway, it’s just too disturbing how tragic the ending of the film was. I was not really used to seeing such type of film. Through time, Filipino mainstream films became corny. According to our prof, Kisapmata was an entry for the Metro Manila Film Festival. It had many omitted scenes because of the accusations that it criticizes the government. Elements like the evil laughter of Tatang was resembled to a demon and resembled to President Marcos because the father is like a dictator in the film. The depiction of resorting to violence when the father cannot get what he wants was clear in the film as well. And at the beginning scene, a text was flashed on the screen saying (not in exact words) that the film is based on a true story “ang istoryang ito ay hango sa totoong pangyayari”. It connotes that the story in the film is a reflection of what’s happening in the society during that time. Anyway, to sum it up, Filipinos struggled and condemned the government through film as well. But they’ve done it artistically and subtly. Do we really need to be oppressed again like before to create a better work of art (in the form of film, literature, song, visual art, among others)? This entry was posted in Uncategorized and tagged analysis, film 100, introduction to film, Kisapmata, Mike De Leon, Nick Joaquin, reflection, Thriller (genre). Bookmark the permalink.